I thought I’d start by restating the statistics which were presented in the Part 1 blog posting. The survey was segmented into 5 sections, the last being used to cross tabulate the data. Part 1 was about Membership. In this posting (Part 2), I’ll focus on the second section (Programs and Services). In thinking about the best way to discuss this section of the survey, I do believe images, tables, graphs, charts, and such might present the information better than straight text and my words. So let’s start with this chart. That’s the big picture view of AOCS products and services. 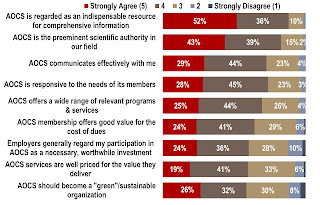 Overall, members are “satisfied” with the product or service - even those areas that are not deem core to member expectations. 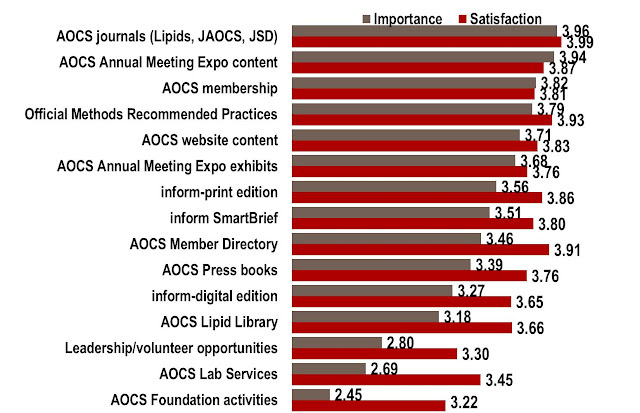 Journals, Annual Meeting content, and AOCS membership are valued by the membership. And the membership equally is satisfied with the delivery of those products and services – along with Official Methods & Recommended Practices and Inform-print edition. The area in which I’ll review over the next several months is why Leadership/volunteer opportunities are not seen as important services to our membership. As I stated in the last blog posting - Over the next year staff will design a strategy to formalize a volunteer program. One of the goals is to show you all ways you can be involved with your Society. You Can! Members were asked to indicate their interest in a series of four possible changes to AOCS services. Receptivity toward them clustered with similar average scores and similar proportions to “definitely or might use”, suggesting that each require a certain amount of encouragement and communications of their benefits to achieve adoption among a slight majority of respondents. With that being said, AOCS is already offering AOCS books on Amazon. So you have a choice of where to purchase the latest AOCS books. Also, we wanted to expand our offerings to those outside our community. We are currently working with Apple to offer an AOCS app to our members. The app would have Inform-digital edition and bundled articles from Inform. These bundles would be articles from specific topic areas. Look for the app announcement this summer. We are finding out that Apple requires a lot of information (read that as paperwork) to offer an app. The other 2 options are being reviewed by AOCS staff. Every year we refine the dues/renewal process. Paying dues by EFT/PayPal and offering multi-year memberships might be possible refinements to the dues processing. The uncertainty here is will your company pay for multi-year dues, and does your company pay dues by PayPal/EFT. We are finding more and more companies paying dues by EFT, but not PayPal. So the PayPal option would be for those members personally paying for AOCS membership and products. The last question in this section addressed your opinion of AOCS. So let’s look at another chart. Well, as I state in our membership marketing material – AOCS is THE premier organization for your scientific needs. I take these results to valid that statement. What is of concern to me in this chart is the response to “AOCS services are well priced for the value they deliver.” Only 19% strongly agreed. My task is now to show you the value of your membership. 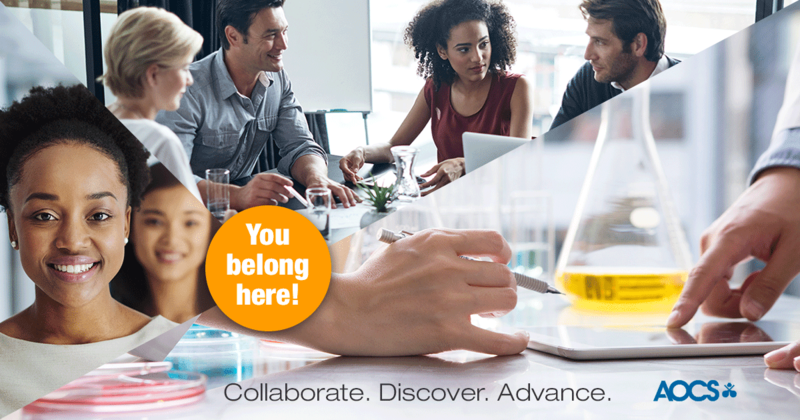 Have you seen the updated “Membership Opportunities” webpage. That page shows you the hard cost (savings) your membership provides. Summary: $1315 worth of products/services for $160. But I’m assuming that most of you responded with “membership dues” in mind when answering this question – not on the price of the annual meeting or a book, etc. You expect your Society to help you develop your career; provide “indispensable resources” – to help you solve a problem. 40% may not be finding that type of value within our membership. Hence, my task of showing you this type of value. Check out our member videos on the AOCS YouTube channel (AOCS1909) – they tell you directly how they value AOCS membership. Well, if you made it to this point of the message, I thank you. You must like data! Me too. If you have any questions about the survey and its results, please contact me. Or if you disagree with anything I state, then let me know. I find it very helpful to have other opinions on what the data means.